Email Marketing ebook “Email Essentials” includes chapters on Introduction, Basics Of Email Marketing, List Building Essentials, Writing Compelling Email Headlines, Email Copywriting Essentials, Email Links & Click-throughs, Advanced Email Marketing Tricks and Email Marketing Mistakes To Avoid. Ebook comes with give away rights. and master resell right. 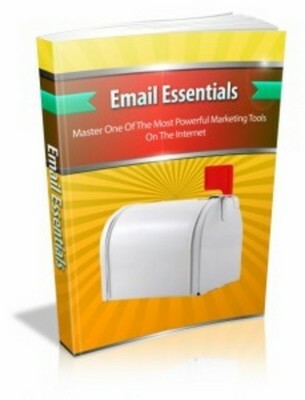 Immediately Email Essentials Tap Into The Email Marketing Secrets Of The Top Marketing Gurus With This Turn-Key Email Marketing Manual And Start Generating Autopilot Profits! Email Essentials MRR Rights email marketing;mrr rights 148173126 3.20 tradecenter Fresh Download Available!